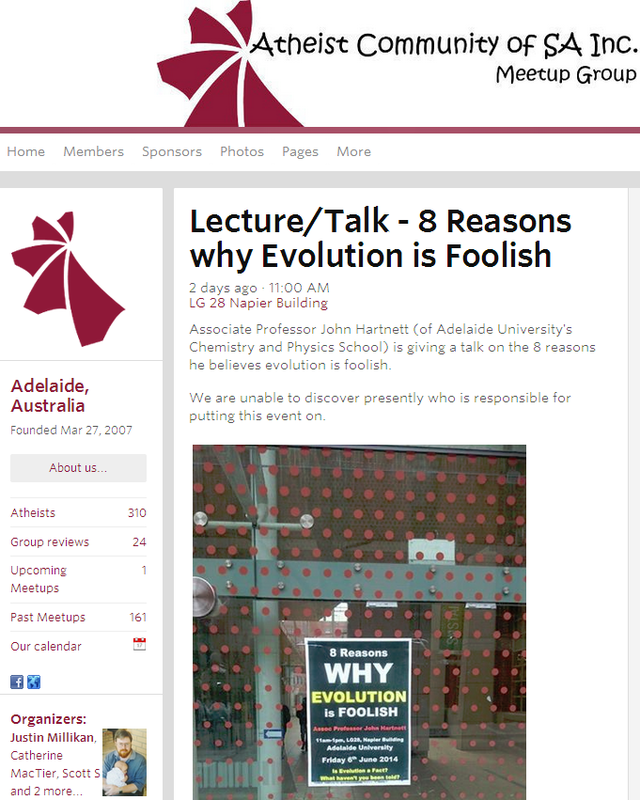 On Friday June 6th, I presented a lecture at the University of Adelaide entitled “8 Reasons Why Evolution is Foolish” to an audience of about 55, filling about half of the seating in a small lecture theatre. I spoke on the topic for about 60 minutes presenting my 8 reasons via 8 questions which, so far, have not been answered by evolutionists. Following the lecture we had about 40 minutes of Q&A. The video of the lecture is here. An organised group of atheists turned out to “strike a blow for science against creationism and the supernatural” by taking me on. That is what they claimed on their website.1 See left excerpt. There were about 10 members of some atheist club, who peppered themselves through the audience. After the event one guy identified himself as president of some atheist club, so it is clear they came with an action plan. I had been forewarned that something like this might happen as one contact told me that there had been a lot of activity on a university-connected FB page about this event. But their arguments and the questions they put to me in the Q&A were a total failure. From the post on their community website, it is clear, that was their intention—to get a blow in against me. But alas, it seems, I did not give them the satisfaction. 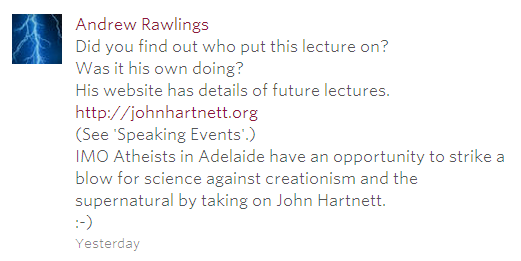 I offered to debate an atheist or evolutionist but told them the university would never sponsor such an event. I think they know that would be the case. It does not seem to scare them that their stated purpose is to ‘strike a blow…against…the supernatural.’ I suppose if there is no god, you wouldn’t be. But I can’t be too critical of them because when I was in my first few years as an undergrad student at the University of Western Australia in the 1970s I was an atheist, and I was active against Christian groups by arguing with them, engaging them wherever I could. I disputed in a similar manner. I believed in science, that it had all the answers. Actually, I know now that I believed in ‘scientism.’ We must recognise that this a spiritual battle we wage here. By pure reasoning, I could not have been convinced of the truth of the biblical history back then. It took direct revelation from the Creator himself who revealed Himself to me, and brought me to my knees in humble repentance. Thank God for that! But I know now that back then I was not neutral. I was at war against the supernatural, because I did not want to humble my pride and bring myself under His law. These men and women are doing the same. Please pray that they also may come to know His grace and love. The following are two comments from the audience who were clearly in support of my efforts. Here is my report on the first lecture I gave a few months earlier: WHY BELIEVE IN GOD IN AN AGE OF SCIENCE? Here is a link to the book I recommended at the end of the lecture: The Creation Answers Book. The chapters are freely available for download as pdf’s. Update: YouTube video of the lecture.